Buy With Confidence is the only national scheme run directly by Trading Standards. It is a not for profit organisation unlike many other moneymaking schemes. Buy with Confidence has been set up by Northamptonshire County Council to help customers find businesses across Northamptonshire that they can trust. To be approved companies are put through stringent tests which are carried out by Trading Standards. Companies are checked for trustworthiness and compliance with consumer protection Laws. Criminal record checks are carried out for staff entering customers homes. Qualifications, experience and insurance are also checked. Companies are put through rigorous testing before they are approved by Which? Trusted Trader. This service is available to anyone searching for tradespeople in the home. Worcester Bosch Accredited Installer 1st Gas are accredited for Worcester Repairs, Worcester Boiler Servicing and Worcester Boiler Installations. 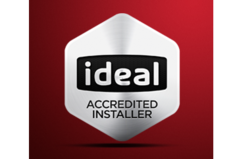 Ideal Accredited Installer We are also accredited for Ideal Boiler Repairs, Ideal Boiler Servicing and Ideal Boiler Installations.